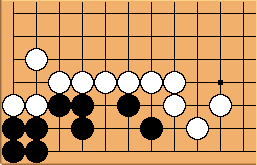 This variation, from tsumego.tasuki.org, is much simpler than the standard problem. shevious: Problem 35 and 213 have different name and solution though their shapes are quite similar. Maybe we should separate to two independent problems as in Kim In and Go Seigen's book. Problem 35 is Little Wire Net and Problem 213 is Big Wire Net from tsumego.tasuki.org.